Fitting a UST to an UTAUloid? Namely, the changing of an .UST to make it fit the oto.ini of the UTAU I am using. Re: Fitting a UST to an UTAUloid? Make sure UST is in Mode2. Then, select all, right click a note, last option. 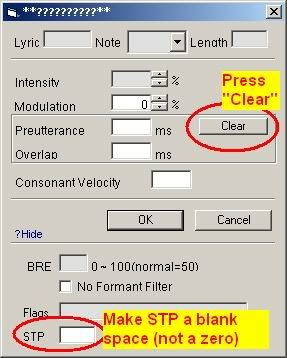 Clear the Pre-utterance, Overlap and STP, then press okay. Press ACPT, P2P3 (or P1P4, doesn't matter), then ACPT again. Unless there's special enveloping that you want to keep, in which case you can just press ACPT. Whoa whoa... I cleared everything and then... I need to press what? Where? Ah, OK! Thank you very much. Shouldn't this thread be sticked or in a tutorial of some short? It's really a thing you need to know if you are going to use pre-made USTs.... and I didn't know it before I read this post. Modulation must be zero if you want the samples to sound exatly in pitch ignoring the original sample, isn't it? Or what it is exactly? And then press the ACTP button. Before I had no idea these buttons exist... or how they worked.